Wednesday 23 November 2016, time 09:30 - 18:00. The report of the day is now available to download on the right hand side of this page. 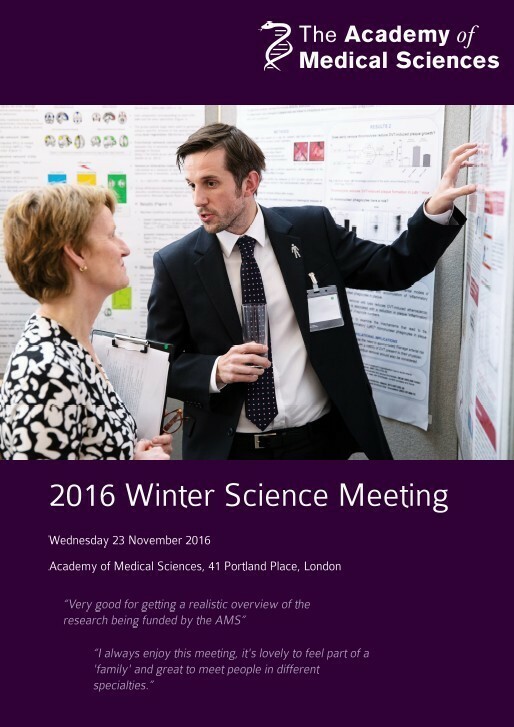 The Academy of Medical Sciences held its fourth Winter Science Meeting for Starter Grant Holders in November 2016, which brought together Starter Grant holders, Academy Fellows, funder representatives and for the first time a new cohort; our first round of Springboard awardees. This event gave Starter Grant Holders and Springboard awardees the opportunity to present their work, network with each other, Academy Fellows and funders, and explore the next steps in their career. In total we had over 80 people join us for the day. Our Keynote lecturer was Professor Sadaf Farooqi, a physician and endocrinologist who made the human leptin gene discovery in 1997. Sadaf Farooqi's pioneering research has helped us understand the genetic and molecular basis for obesity, and how hypothalamic regulation plays its role in human food intake. You can find more information of Professor Sadaf Farooqi on the Genetics of Obesity Study website, and discussing her research here. Selected attendees were invited to present their work through either a 15 minute oral plenary talk, short 'Research in 3' talk or a poster presentation. These were judged by Starter Grant Panel members, with the best presentations in each category winning £250. It was a fantastic day, with a lot of great talks and enthusiasm for interdisciplinary collaboration.